Cardboardia’s project lab on The Moscow International Education Fair 2015. From 6 to 17 April in the "Made in Cardboardia" workhop will be held a series of design workshops for artists, designers, directors, and the most importantly - people with disabilities and teachers working in this area, which will result in the creation of a unique space and performance. The premiere of the performance will be at April 17 on The Moscow International Education Fair 2015 on the festival "Nadezhda" ("Hope"). Program Partners: "Academic" Cultural center and the program of the Moscow Department of Culture "Together we are wizards." "First Library of City Stories"
Dates: 6 – 17 of April, 2015, daily from 11-00 to 19-00. Final Event: 17 of April, The Moscow International Education Fair 2015. Cardboardia parade on Spoffin (NL) from Stories from Cardboardia on Vimeo. By late August of this year, in the low countries of Amersfoort there shall be a Parade of Dreams directed by the Tyran of Cardboardia. The time has come when the Tyran of Cardboardia officially announced the expansion of influence of his phantasies. "We must ensure fertile soil for the fruit of my imagination. This garden shall flourish in every corner of the Earth!" - Tyran commented in an interview. The leader of the nation promised to make available to the blessed public the most exquisite corners of his kingly mind. At his command the craftsmen of Made in Cardboardia built the Dream Machine. The machine emits somnifacient radiation that induces daydreaming in humans. The dreams they start having materialize without fail. This summer us the first time in history when the Dream machine is installed and launched in a European country. The machine's somnifacient radiation shall be popularized among the population by the Minister of Education, the Minister or Culture and the Minister of Cardboard of Cardboardia. Every one of them has been appointed to implement the "Make your dream" program amongst the citizens and guests of the Netherlands. In the meantime, a group of Cardboardia personages infested with ideas of opposition, united with a professional group of awakers known as "Wake Up" are doing their best to emphasize the dangerous effect of daydreaming and prepare a move to awaken the dormant masses. The confrontation of "Make your Dream" and "Wake Up" will the the crescendo final point of the Intensive Street Performace Lab. Personages of Cardboardia are happy to welcome anyone who wishes to create big, perform loud and parade the streets of Amersfoort! If you want to learn creating with cardboard or get better at what you already know; if you are looking for a powerful experience, for being a part of a large creative project and making new friends - join us at the Lab! Throughout the several days of our intensive Lab we will create a large-scale interactive space and prepare a city parade of cardboard awesomeness. In Module 1, designers will learn basic and advanced techniques of creating costumes, decorations and objects from cardboard. The program could be particularly interesting for artists and architects, school teachers and designers. Those who take part in Module 2 will go through the entire cycle of preparing a city event - adapting the concept to the location, preparation and management. The module is curated by a brilliant street theater director, so we especially welcome stilt walkers and other performing artists to take part. You will learn the basics of interaction with the audiences, exchange stilt walking and performing experience and get to improvise in a new eclectic team. The Lab will end in a series of performances throughout 28-31 of August. 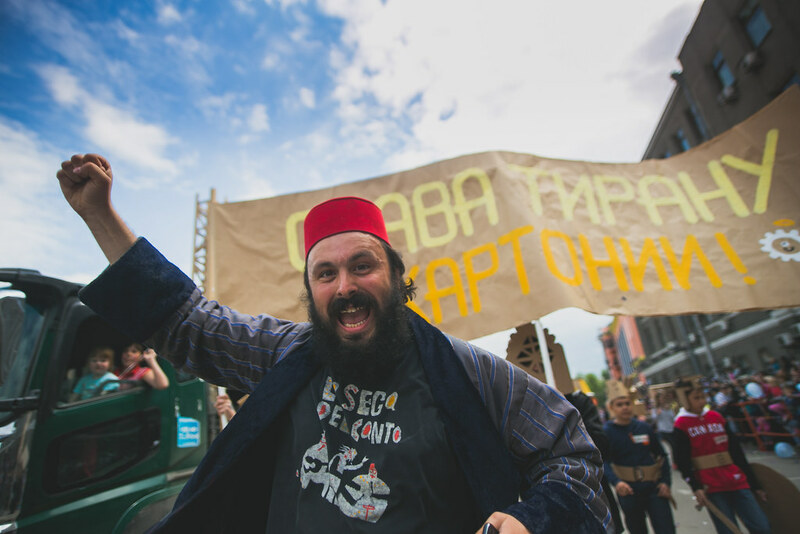 Spyros Andreopoulus (actor, director, stilt performer, founder of Motus Terrae Theatre Company) and Olesya Kandalintseva (artist, designer, workshop curator at Made in Cardboardia). Participation in the Lab is free, yet the number of participants is limited. Groups will be formed following the results of online interviews. Lab participants will need to take care of their daily expenses and costs of travel and stay in Amersfoort (Netherlands). In order to take part in the Lab you need to fill out the application form, complete a test piece and receive the confirmation from the curator. In the early beginning of 2014 the Tyran of Cardboardia approved a road map for expanding the country's international relations over the next 5 years. The first step to be taken is to open the european embassy of Cardboardia in Riga, Latvia. As the Tyran's administration representatives assure, embassy's major function would be to facilitate meetings at the summit, holding Cardboardia's national celebrations, and promote materializations of Cardboard Towns across the EU countries. A number of cultural events are to be held each year. The projects will be carried out by the general contractor of the Tyran's administration, "Made in Cardboardia" creative studio that will open a workshop as a part of the embassy. 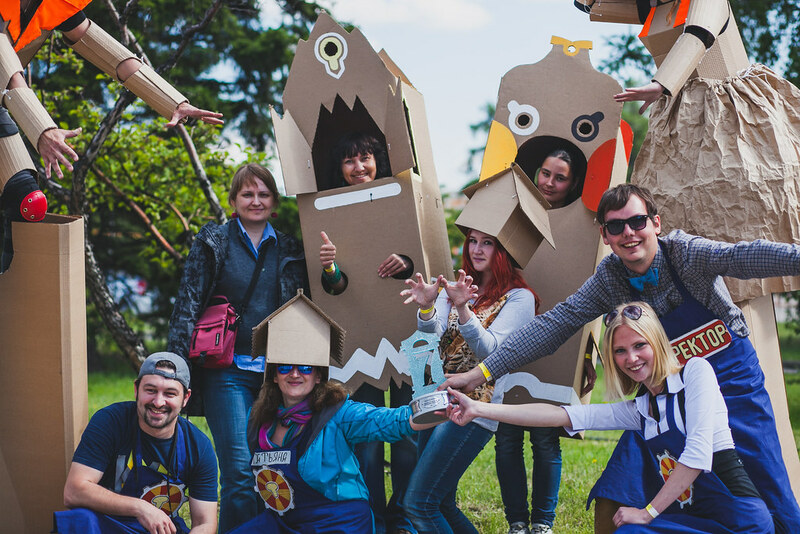 Cardboardia's personages are determined to strengthen cultural ties with the countires of the Baltic region, with focus on Latvia. Tyran is personally directing the opening of the embassy and will thus be making an extended visit to Riga. We will be delighted to welcome the press and everyone else interested in establishing contact to the embassy between Jul 20th and 26th. Thank you for reaching us at +7 916 650 7360 and making an appointment beforehand. Jul 19th, (Paper Object Festival, Kalnciema Quarter, Kalnciema 35 iela) we invite you to a performance of Cardbodia's DIY Theatre. It is a theatre created and run by the audience.